Perhaps Arnold's most well known images are those of Marilyn Monroe, whom she first photographed in the early 1950s. The images of Monroe from the set of the film The Misfits over the summer of 1960 perhaps are among the most revealing and poignant captured of the doomed star. The film was in production throughout a turbulent time in Monroe's life as she experienced the unravelling of her marriage to playwright Arthur Miller. Magnum was given exclusive access to photograph the production of The Misfits directed by John Huston and starring Clark Gable and Montgomery Clift alongside Monroe. Arnold joined the rest of the members of the agency at the time - Cornel Capa, Henri Cartier-Bresson, Bruce Davidson, Elliott Erwitt, Ernst Haas, Erich Hartman, Inge Morath and Dennis Stock - in the Nevada desert for the four month shoot. Monroe was the star attraction on set and Arnold seemed to have the most privileged relationship with her. "At photo sessions, she was in total control," the photographer later recalled. "She manipulated everything - me, the camera. She knew a lot about cameras and I had never met anyone who could make them respond the way she did. So she got what she wanted, because she wasn't under all the kinds of pressure she felt during a film-shoot: remembering her lines, enduring hours of preparation. With me, she was in charge of the situations." On the set of The Misfits, there was a lot of hurry up and wait - not unusual for any film production - but this time everyone had to wait for Marilyn. "The big gossip was always, Would Marilyn work that day?" said Arnold, adding that Monroe, who'd just finished filming Let's Make Love, had admitted to her, "I'm 34 years old. I've been dancing for six months. I've had no rest, I'm exhausted." Eva Arnold fotografa Mrilyn seminuda su una sedia. 1960. 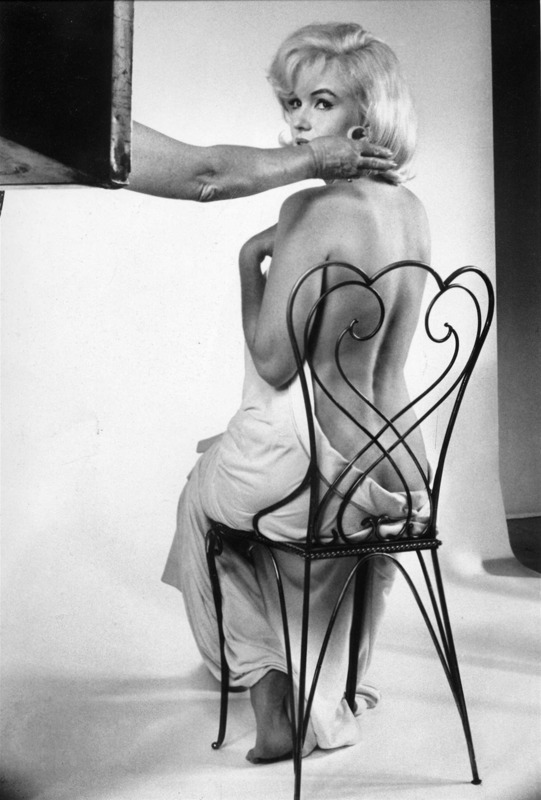 B&W Marilyn con il costume per Gli Spostati 1962. Foto di Eve Arnold. Eve Arnold. Il costume da bagno a due pezzi per Marilyn per Something's got to give. 1962. 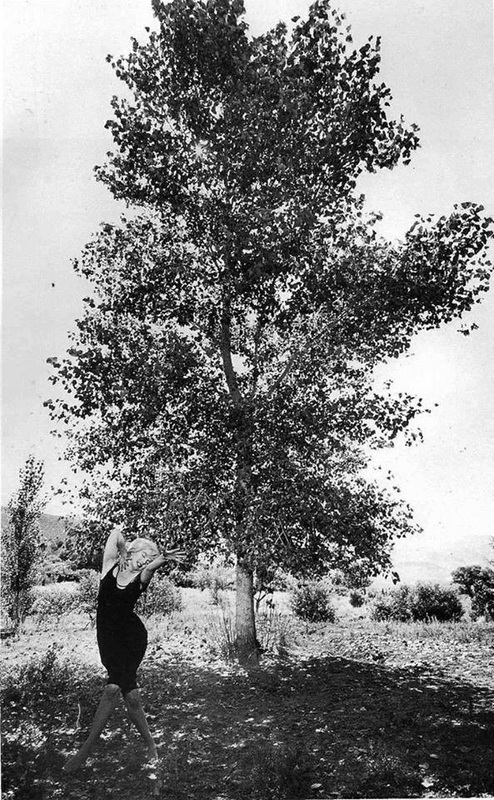 Marilyn danza scompostamente vicino ad un albero per Eve Arnold. 1960. 1960. Mentre gira Gli Spostati Eve Arnold la fotografa fuori scena.